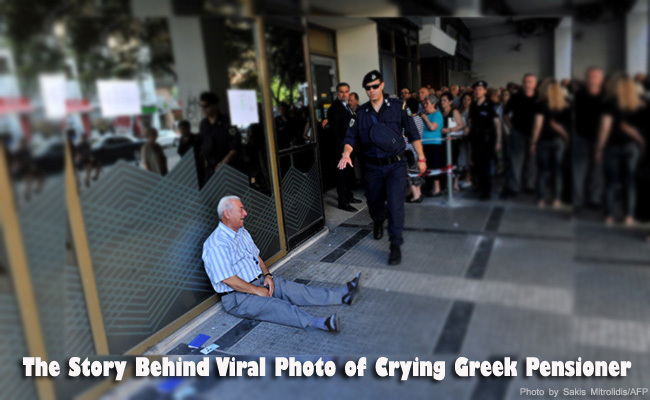 In the midst of the Greece debt crisis, an emotional photograph of a crying Greek pensioner had surfaced online and captured the hearts of netizens. Outside tha national bank, the man was seen beside his ID and bankbook, sitting on the floor and crying. The retiree was identified as Giorgos Chatzifotiadis who had fallen in line in three banks in in the city of Thessaloniki in Greece last Friday, Luly 3, 2015, hoping that he could finally receive his wife’s pension. But to his disappointment, he was told that he could not get the said pension of 120 euros ($133). By the fourth time he was told the same thing in the fouth bank he had queued in, he could not help but collapse outside the bank and weep. Accroding to Agence France-Presse, the 77 year old pensioner did not only weep for his personal dilemma, but also for his country. He could not bare seeing his country in such despair. His emotions caught in the photo of an AFP photographer had given an insight on how Greek nationals feel during their country’s distress. It was on Monday when Athens had shut down all of the banks and imposed capital controls to help in the debt crisis, however, some banks were allowed to open for three days starting from July 1 until 3 for the retirees who do not have bank cards. They could withdraw their pensions but with a cap of 120 euros. Chatzifotiadis shared that after learning that he could not get his wife’s pension, he collapsed. He had been in Germany and worked in a coal mine. Many Greeks blamed Berlin for demanding the government to be strict in fresh international aid. The pensioner also said that he could not stand seeing his country men begging for money to buy food and many are even doing suicides. He even added that despite the mistakes done by Europe and Greece, a solution must be done.